(Bloomberg) -- General Electric Co. plunged the most in the S&P 500 after a top analyst recommended selling the battered company’s shares, damping enthusiasm for a nascent turnaround. 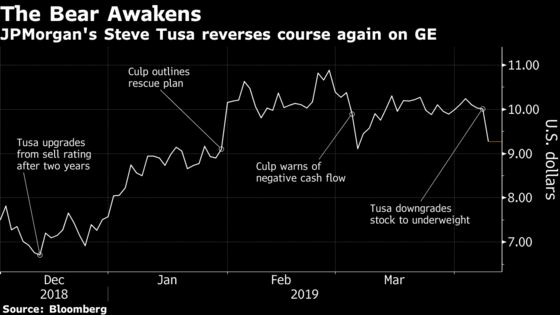 “Investors are underestimating the severity of the challenges and underlying risks at GE, while overestimating the value of small positives,” Tusa said in a note. The analyst pointed to severely constrained free cash flow, which will limit earnings potential. The bearish comments underscore the challenges facing new Chief Executive Officer Larry Culp as he tries to repair GE’s damaged balance sheet and regain investor trust amid one of the worst slumps in the company’s 127-year history. Since taking the helm in October, Culp has sold assets and cut costs in an effort to accelerate the turnaround. Through last week, the moves had helped drive a stock gain of about 50 percent since mid-December, when Tusa caused a stir by upgrading GE to neutral and saying the company’s troubles appeared to be dissipating. The analyst at that point had had a sell rating on the shares for more than two years and had firmly established himself as the leading bear on GE during the company’s stock-market collapse. GE has been largely stagnant since Culp last month revealed that the Boston-based company would burn as much as $2 billion in free cash flow this year. While he didn’t offer specific forecasts beyond 2019, he said there would be “significant improvement” in 2020 and 2021. High leverage “leaves the company vulnerable to liquidity issues in the event of a recession,” Tusa said. Currently, 10 firms have buy ratings on GE, while nine recommend holding it and three have the equivalent of sell ratings on the stock, according to data compiled by Bloomberg. The average price target is $11. Separately, GE was fined 52 million euros ($58.4 million) for misleading the European Union’s regulators during their review of its 1.5 billion-euro takeover of LM Wind Power, which designs and produces blades used in wind turbines.